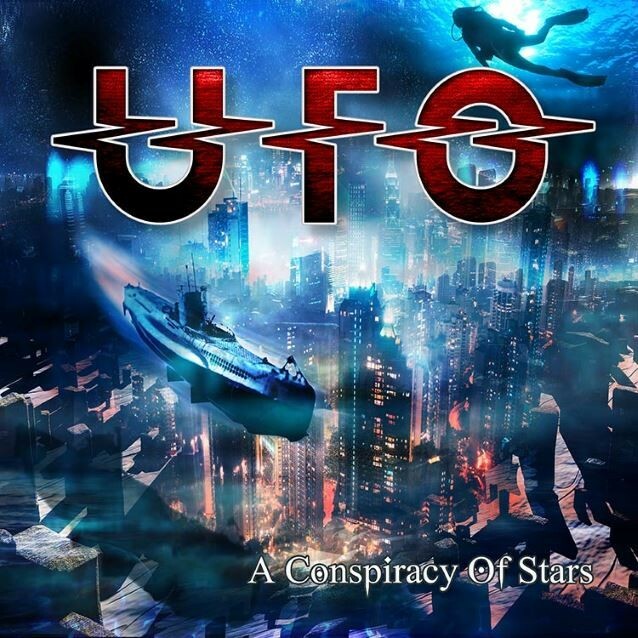 There can't be many reading Fireworks that don't know the history and legacy of UFO. Given some of their past "adventures", it's a near miracle that they're still a living, working band at all... never mind presenting us with the excellent 'A Conspiracy of Stars', the bands twenty-second studio album and surprisingly the first to be recorded in the U.K. for over twenty years. It's also the first to feature Rob de Luca (bass), having been part of the touring band since 2012. Moore too throws in some great solos with a sound and tone that after five albums and over ten years, has what has become a distinctive UFO feel. 'Devil's In The Detail' is another highlight; a mid-tempo romp, again with Mogg's vocals pushing it along in classic UFO style. De Luca has slotted in seamlessly even contributing to the writing of a couple of tracks and as ever, the contribution of Andy Parker and Paul Raymond shouldn't be under estimated. Raymond's keyboards provide the subtle melodies that underpin everything and allow Moore and Mogg to let rip with their power and passion; 'Precious Cargo' being a prime example. Recorded at his own studio, Chris Tsangarides has done a superb job with the production; it's sharp, well balanced without ever sounding too clinical. Sure, certain song sections have a familiar feel to them and Mogg's phrasing of one or two lyrics seems reminiscent of past songs, but there's always enough quality to shine through. 'One And Only' and 'Rolling, Rolling' are another pair that stand out in bringing that blend of guitar and keyboards, muscle and melody together. Whilst I don't think there's one stand out song, what UFO have produced is an album of a consistently high standard throughout. Mogg's vocals and lyrics excel, but this is a true band album where each member has made a significant contribution. This album looks and sounds like a throwback to the band's prime and in this form, it's definitely one not to miss.